In this animated comedy, an ignorant patriarch presides over a family that includes a non-descript wife and couple of troublesome kids. Also, there's an evil-genius baby and a talking dog. Seth McFarland created this series, which is definitely aimed at an adult audience. Milestone 300th episodeStewie and Brian get into a friendship-ending fight after Brian commits a terrible act to one of Stewie's beloved toys. Meanwhile, Peter refuses to wash his hand after meeting his favorite breakfast cereal mascot, Boo Berry. The writer/director/producer says the network's owner supports the controversial immigration policy. The network is trying something different, and its bold move could change the way that you watch TV on your phone or computer. Family Guy doesn't play nice with anyone, and this week, soon-to-be Republican presidential nominee Donald Trump was the target of the show's satirical jabs. James Woods sues the pants off another Twitter user for defamation. MacFarlane hit "Ted" might have a secret... Was it ripped off from a web series called "Charlie the Abusive Teddy Bear?" Part of the fun of Comic Con is dressing up as your favorite fictional character. But while most people opt for an impressive superhero costume, this guy decided to use his natural assets to his advantage. Meet Robert Franzese. Robert is pretty much the best Peter Griffin impersonator besides "Family Guy" creator Seth McFarlane himself. Actually, if we're counting physical appearance in the mix, then Robert even beats McFarlane at impersonating his own character. Family Guy is currently available to watch free on Adult Swim and stream on FOX. 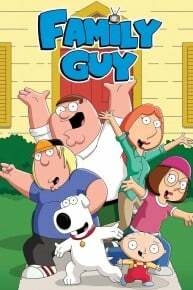 You can also stream, download, buy, rent Family Guy on demand at FX+, Amazon, Hulu, FOX, Vudu, TBS, FuboTV, Sling, FandangoNow, Google Play, iTunes online.